These photos were taken in a private backyard in Pine, Louisiana. The yard is on the hummingbird migratory path. 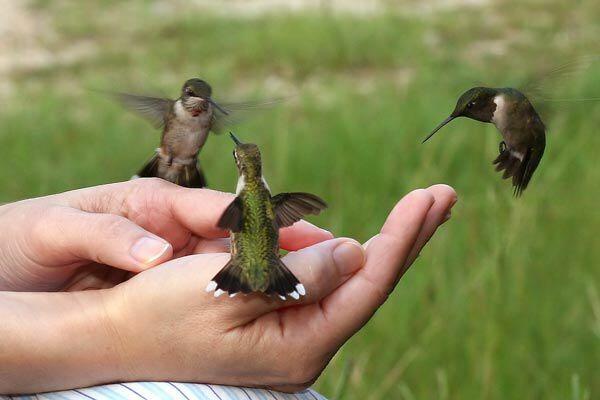 The woman in the picture puts out sugar water for the hummingbirds and studies them. On the day the photos were taken, she decided to see what would happen if she put the bowl of sugar water in her hand. The birds were so comfortable with her that they drank right out of the bowl from her hand! I plant lots of perennials to lure hummingbirds into my garden in suburban Boston, and they do come, but oh so fleetingly! I have never even had chance to take a photo. I would love to have them sit in my hand as in these photos and have my photo taken with them. 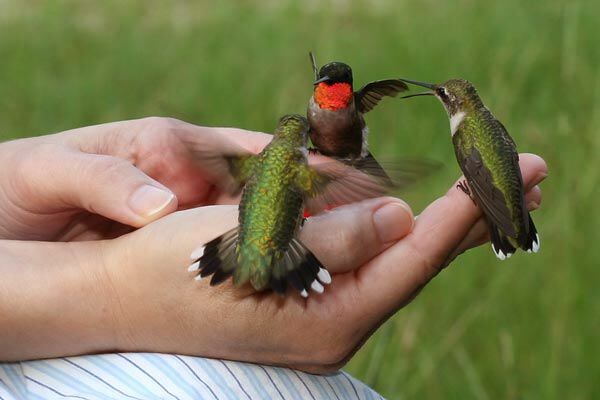 But, on the other hand, like my garden itself, I consider the visit of a hummingbird an ephemeral event to be enjoyed in the moment, a reward from nature for the work I do in my garden to make it someplace a hummingbird will want to come to spend some time.